Honey, Let's Get A Boat! Honey, Let's Get a Boat, by Rob & Eva Stob. ?1999 Raven Cove Publishers. 285 pp. ISBN:0-9669140-0-7 $18.95. Cruising is a pleasure in many ways. It?s a great way to travel, relax and spend time with nature and family. Cruising is a wonderful way to meet new people and see new places. All of these pleasures are readily sought after when indulging in the fantasy of embarking on a cruise anywhere. But few people realize that, in addition to the possibility of all these wonderful experiences, cruising might just change you as a person. That is what Rob and Eva Stob found on their journey cruising on their trawler around America?s Great Loop. It started out innocently enough: the Stob?s chartered a boat for a week with another couple and had such a great experience, that after returning home Eva couldn?t get the memory out of her head. Although she had no boating experience, she inspired Rob with her fantasy of cruising full time on a boat. So, after formulating a plan, they went through the process of learning boating skills and safety, rented out their house and bought a boat. 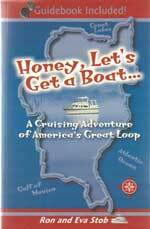 Their idea was to cruise for one year the inland waterways of the eastern United States, which when connected, are known as America?s Great Loop. When they began their journey in Ft. Lauderdale they were wet behind the ears with a steep learning curve ahead of them. Their first day on the boat was an anxious experience for them, especially when docking at a marina for the first time by themselves. They soon learned that boating requires a lot of patience, and sometimes, a lot of cash. In their book, the Stob?s describe the challenges as well as the joys of cruising. The challenges ranged from mechanical failures to open water crossings, learning how to go through locks and how to handle the river traffic of the great Mississippi. But, through it all, Rob and Eva encouraged each other and learned from each other as new aspects of their personalities developed. They became more confident, both in themselves, in each other, and in their vessel, and as a result became closer as a couple. Rob draws from his journals to paint colorful portraits of the towns and communities along the US east coast?s Intracoastal Waterway. Every state was a new and exciting experience, from Florida to New York, then up the Hudson River to the Trent-Severn Waterway, across portions of Lake Ontario, Lake Huron and Lake Michigan, then down the Illinois and Mississippi Rivers, the Tenn-Tom Waterway, out to the Gulf of Mexico, down the Gulf Coast of Florida and across the Okeechobee Waterway to finish their journey in Stuart, FL. In their book, Rob and Eva describe everything from the geography to the local cuisine, historical facts of each region, in a way which inspires the reader to want to visit each place themselves. There are many reasons why I recommend this book, but the biggest reason is that Rob and Eva demonstrate that boating is a sport to be enjoyed by people of all ages, from novices to experts, and that the experience will enrich their lives in unimagined ways. They also prove that cruising is not a past time for the young- it doesn?t matter whether you are in your twenties, forty-something, semi-retired or retired. If you have the dream, Rob and Eva?s book will encourage you and give you practical information and advice on how to make it a reality. And who knows, you might just learn a thing or two about yourself in the process!